Review by Tom Hastings. 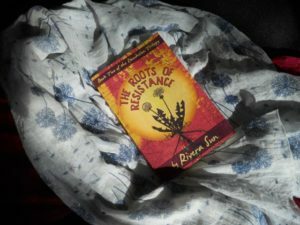 The Roots of Resistance is now available on this website and in ebook and print formats on Amazon and all major online bookstores! Rivera Sun caused quite a big stir in the relatively small but passionate world of nonviolent resistance with her 2013 extrapolative fiction, The Dandelion Insurrection and again with her 2016 magical novel, The Way Between. Her latest, The Roots of Resistance, tops those two popular earlier efforts in several ways, most strikingly, Sun’s far more sophisticated weave of the most important yet often arcane elements of the theory and practice of strategic nonviolence seamlessly into a plot that draws the reader along. Full disclosure: Sun is a friend and colleague in the national and international community of those who educate, train, and practice nonviolent campaigning. I’ve reviewed the above-mentioned works favorably and we (my students and I) have twice brought her to speak and train at our university. I was an early manuscript reader of the first portion of this book. It will be one of the required texts in my summer course, Peace Novels. Like another of my favorite fiction writers, Barbara Kingsolver, Sun writes engagingly and packs her narrative with eye-opening action verbs and sparkling figures of speech as well as those cliff-hanging chapter endings that make it impossible to stop reading. The reader is advised to read the precursor, The Dandelion Insurrection, if possible, so all the characters and the outcome of that story are known at the beginning of this new book. The story of this book can stand alone but why cheat yourself? The plot commences after the Dandelion Insurrection–a version of people power in some ways similar to the one that ousted Ferdinand Marcos in the Philippines in 1986–has successfully brought down a corrupt and violent administration. During a mass celebration of that victory, a gratuitous drone attack slaughtered many, including one of the elder leaders of the Dandelion Insurrection, mother of one of the two young core leaders. After a period of mourning, unctuously “led” by the Interim President, the Dandelion Insurrection leadership sees no legitimate change in poverty rates, polluting extractive industries, and other social bads. Switching out one elite leader, they realize, is not enough. As they organize to address this by pushing a major piece of federal legislation meant to radically alleviate some pressing problems, hidden forces are organizing to destroy the movement in several ways. At each juncture, Sun realistically creates problems and solutions, deepening problems, evermore creative ripostes. Her grasp of what really happens informs her tale of what really might happen. Without a shred of the pedantic, Sun artfully weaves in the explanations of the theories of strategic nonviolence, making the novel a teaching tool. Some of the challenges to real life campaigns she manages to thread into her narrative include, but are not limited to: mainstream media, recruitment, tactical sequencing, technology hacking, violent flanks, systemic cooptation, de-escalation, gender, generational alienation, rumor control, fake news, movement preservation under brutal repression, agents provocateurs, romantic meddling, leaderless v leaderful, coalitional coherence, decision-making, nonviolent discipline, backfire, and transparency. If you are a male raised in the US you might wish to read this book in a private place so no one can see the times you might come close to crying at the clarity of conscience and pain of pressures inextricably intertwined in the lives of the insurrectionists. Sun brings them to life and their lives become important, with events roiling so swiftly that at some point you just stay up reading it way past your bedtime. The police chief stared balefully at the students, teachers, and families, and exhaled in a long sigh. He respected Idah Robbins, but she stirred up trouble for justice like a favorite cocktail after work. He sometimes wished he had a normal hobby like crocheting or marathon running. Billed as “Book Two of the Dandelion Trilogy,” this one makes me hope Sun is punching out Book Three soon and perhaps, like Douglas Adams, will give us, someday, Books Four and Five of the Trilogy. ~~reviewed by Tom H. Hastings, Conflict Resolution Assistant Professor, Portland State University. Hooray! We did it! Congrats and thank you to everyone! I just finished the book! I have fallen in love with Rivera Sun’s poetic (by the way, she has a superb book of down to earth poems too called Skylandia, just as good!) writings, and have often found myself with wet eyes reading, first with the original Dandelion Insurrection, and again with this one. Yes, read Dandelion Insurrection first, then this sequel. The characters continue, further engaged. What impressed me most, I think was her sophisticated understanding of the roles of cooptation and of infiltration, lessons we need to learn as we carry out a real life Dandelion Insurrection in the face of the plunder monkeys. Theory is molded through practice, and this book gives us examples of their unity.